Here are even more photos of Rapier powered scale models. Graham Knight designed and built this Heinkel He 178 V2 for Rapier L2 power. 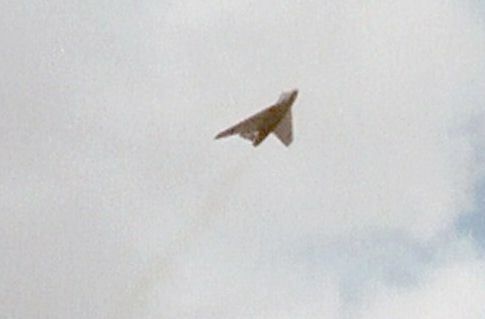 Outlines are scale, apart from the tailplane, which was enlarged by 15%, and the dihedral is also scale. The fuselage is hollowed foam skinned with heavyweight tissue and given 2 coats of Flexikote 2 pack fuel proofer. Wings are traditional balsa construction, covered with lightweight tissue over aluminised Mylar, only a very light dusting of paint (enamel thinned with cellulose) was needed for a totally opaque finish. 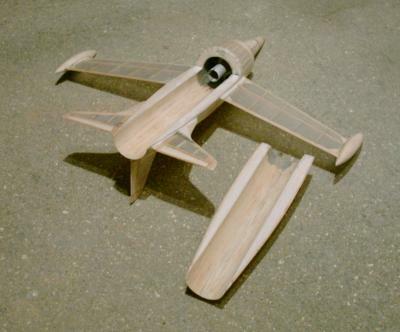 Tail surfaces are 1/20" sheet balsa. It has good layout for a free flight scale jet, and it flies very well. 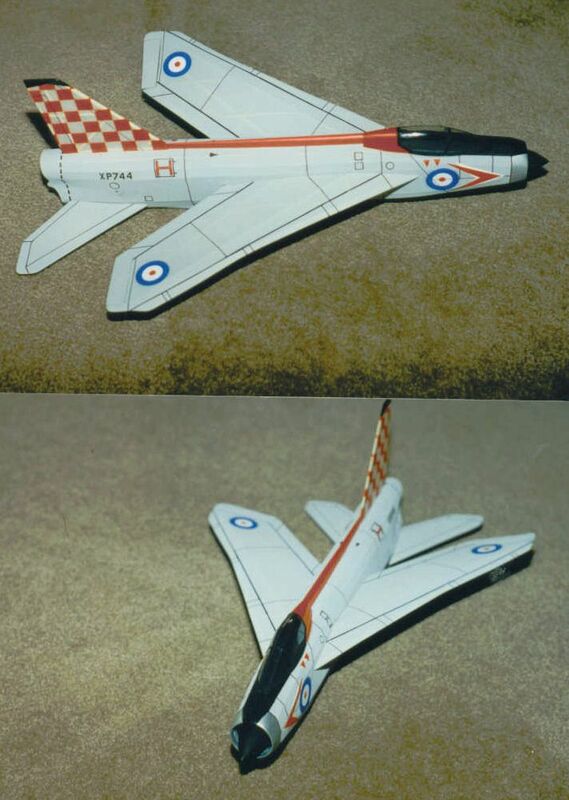 Chris Starleaf is another US modeller who has been flying a Rapier-powered scale model - Here is his Aerographics lightning, which has been performing successfully with both L2 and L2HP motors. 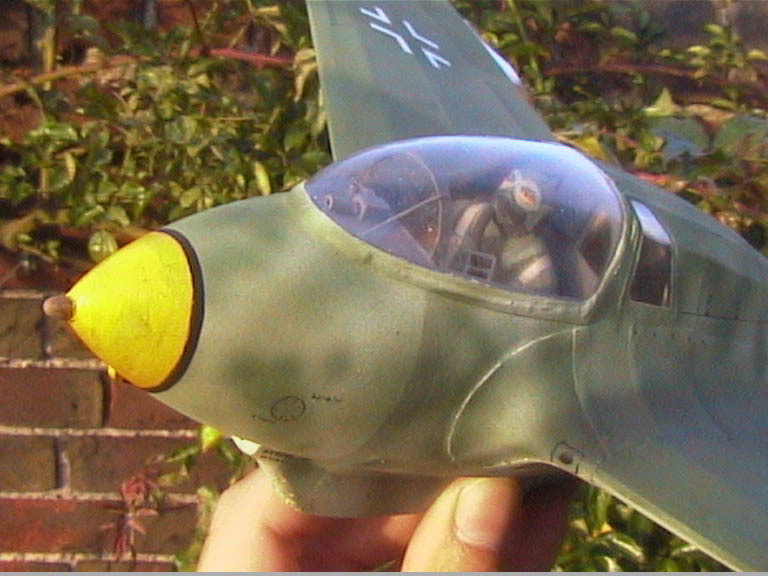 The model was built unmodified from the kit, apart from a new canopy, and weighed a very creditable 30 g - good for such a relatively large model. Finishing was done using Floquil paint and the lining with a Sharpy brand marker pen. Richard Crossley revisited his Me 163 design, and really went to town on this one. Main modification was to narrow the motor trough, freed from the restriction of having to make a Jetex 50 motor fit in there. This one is Rapier L2 only. The narrower trough means a more scale-like skid width. The superb pilot figure is carved from foam, and features the special protective flying suit worn by 163 pilots. Note also the armoured screen in front of the pilot. I can attest that this miniature masterpiece does fly very well. Graham Potter built this nicely finished D.H. Venom from the Easy Built kit. 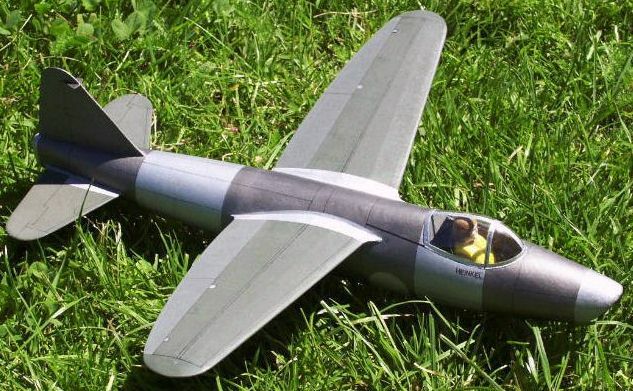 Although designed originally for the Jetex 50 unit, I have seen this model flying very well, and realistically, using a standard Rapier L2 motor. Another of Roger's models is this Fairey Delta FD 2. It is 10.5 inch span and designed for the Rapier L2 HP (high power) motor. All up weight is under 30 grams. Elevators and elevons are movable to aid trimming, allowing washout to be incorporated as an aid to stability. The model has proven to be a good flyer. 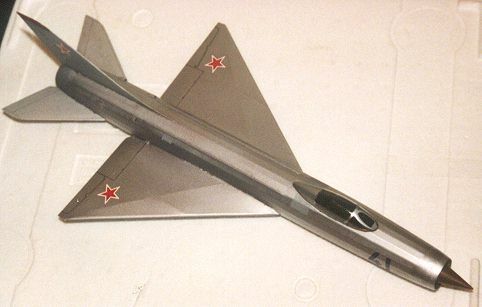 This rather sleek Sukhoi SU-11 is the work of Chris Strachan from a design by Richard Crossley. Power is Rapier L2. Another SU-11 built from Richard's plan, this time by Peter Smart. This one has made its first test flights, and has proved a fast and stable performer. 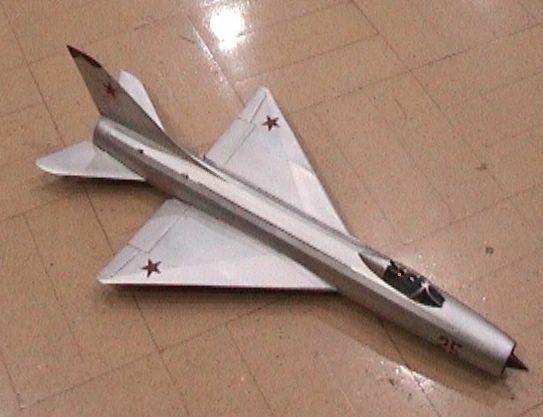 Richard Crossley designed and build this little Mig I-270 to use up some of his old low power Rapier L1 motors. Span is a mere 9", though if it flies OK he may well publish the plan slightly larger at about 10.5" to suit newer, more powerful L1 motors. The model weighs just 7.9 grams without the motor and 12.9 grams all up. The finish is airbrushed silver cellulose, which Richard reckons added just 0.2 grams to the total weight! This English Electric Canberra could well end up as a kit, assuming it flies as well as it looks. Peter Smart built one simultaneously to help iron out any bugs in the design. Span is 16", but look at all that wing area! Scale works out at 1/48th. Richard has finished his in the PRU blue scheme of the prototype. The Rapier L2 motor is mounted conventionally in a fuselage trough. 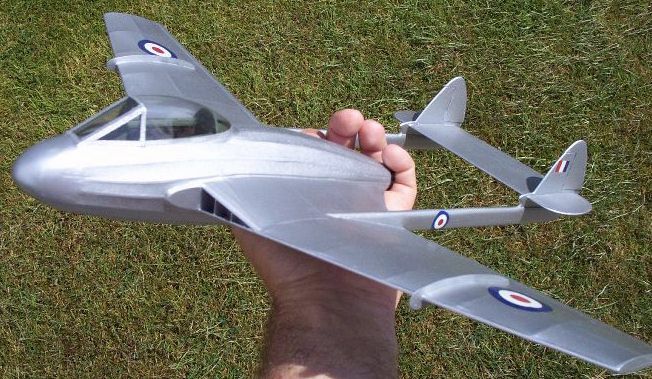 This scale model is of the French Leduc 021 was built to demonstrate that a Rapier motor could be an enclosed and still work. 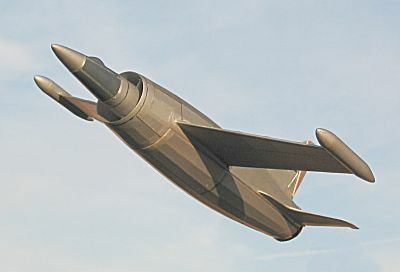 The Leduc O21 was an extraordinary 1950's air launched French equivalent to the Bell X-1, powered by a ramjet of innovative design. 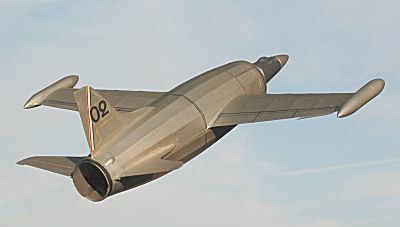 The model is of a similar shape and size to the Aerographics Bell XS-1 or Miles M.52, though the wings are even more diminutive, and have been enlarged slightly. 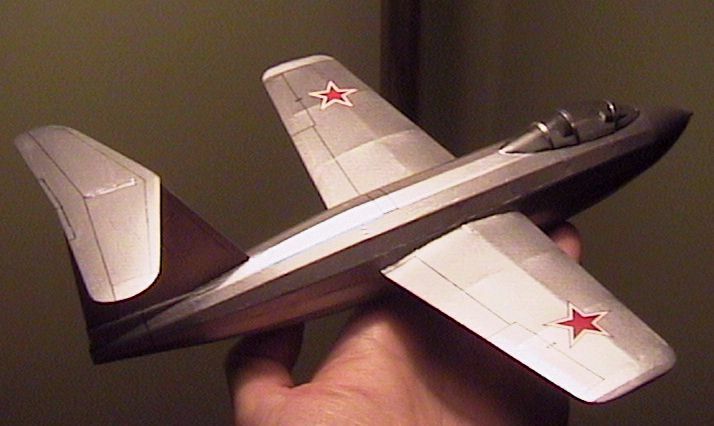 The tail surfaces are also small, and are built up with moveable surfaces The wing span and length are about 11"giving a jet pipe of 1.25" diameter some 8" long. which is large enough for the main body to be built around the jet tube with the L2 motor mounted just forward og the cg in the main pod. 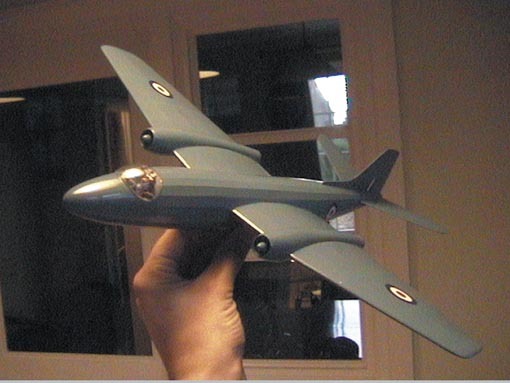 The model weighs about 33g with motor, equivalent to a wing loading of 9 oz/sq.ft. It has made its maiden test flight and appears quite stable and adequately powered.